Example: After winning the lottery, being asked out by a supermodel, and seeing his boss fall down a mineshaft, all in the same day, Simon was on Cloud Nine. On Cloud Nine has a number of explanations, with plenty of contradictory threads. 1) It has been claimed that this is a by-product of weather classification, attributed to both the US Weather Bureau of the 1950’s and the International Cloud Atlas of 1896. 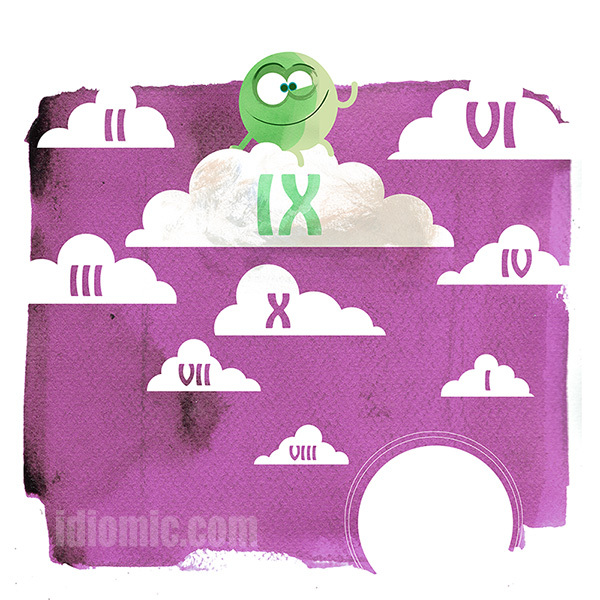 In their categorisation of clouds, set number nine was the billowing cumulonimbus. You know…. the thunderstormy ones. One extra fact seems to negate this explanation. Both scales went to ten. Choosing a second best category to define the ultimate state of happiness seems illogical. 2) A second claim is that this refers to the ninth state of enlightenment in Buddism. But Iddy’s counted those. There are ten of them as well. 3) In Chinese Han mythology, there are nine levels to heaven, nine being the highest, so this seems more fitting. To make matters more confusing, the number nine seems to be a relatively recent arrival to the whole cloud saga. Cloud seven was the most popular version of the phrase for decades, probably related to seventh heaven. Other versions found in print have been clouds 8 and 39. It wasn’t until the 1980’s that the number nine became predominant. In the 1950’s, there was a TV variety show called “Cloud Nine”, but it isn’t clear whether the show or the currently numbered idiom came first. A bit like the chicken and the egg. This is nothing like chicken and egg. We have all known since Darwin that the egg came first. My Dad used the phrase ‘Oh, he’s on cloud nine’ in the 1960s, in reference to someone who wasn’t concentrating because he was happy. Hey Brian… thanks for your comments. I meant there was an argument that the show came first, spawning the phrase, or the phrase came first, spawning the show.